February 24, 2018 at 10:44p.m. Two Australians bought the two-story century home at 586 Belmont St. NE in Warren in 2012 for $8,500. 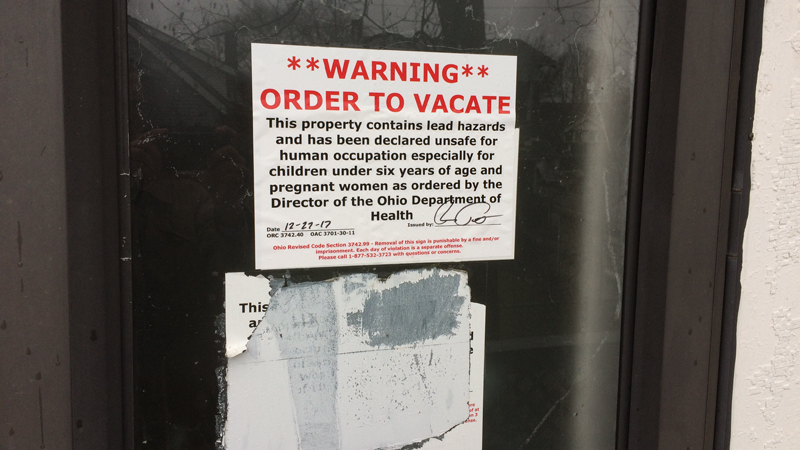 The Ohio Department of Health has declared the vacant home a lead hazard and unfit for human occupation, especially for children under 6 and pregnant women. Such designations usually occur because of lead paint discovered after a child living there had high levels of lead in his blood. Abating lead paint in an average home costs $10,000 to $12,000, the ODH says. Jujuan Smith, who lives next door, has seen the lead-hazard sign on 586 Belmont and wonders whether the peeling paint on the exterior could be harming his four sons, all age 6 and under. “I wish the house could be painted on the outside,” he said, noting that one of his four sons is getting a second blood test this month because the first one raised questions about his lead level. “They want to make sure it’s not rising,” Smith said. Smith is not alone. The house next to him is one of eight in Warren on an ODH list of homes with a documented lead problem. Matt Martin, an expert in Warren housing issues, says those eight are a fraction of the danger. “Lead paint was outlawed in 1978, so everything built before that has lead in it,” said Martin, executive director of Trumbull Neighborhood Partnership, which runs the county land bank, which demolishes and rehabilitates hundreds of homes per year. Not all of the homes that contain lead paint are a threat – only those that have exposed lead paint and lead dust, he said. In Youngstown, 11 homes made the state list. During visits to all eight Warren homes listed, The Vindicator discovered seven are clearly marked with signs warning of the hazard. All also appear to be vacant. The eighth home is occupied with permission of ODH. A woman who spoke to The Vindicator through a speaker connected to her doorbell on Main Avenue Southwest said she’s getting the lead removed but didn’t want to talk about it. Bob Pinti, deputy Warren health commissioner, said the home is not under a vacate order because the family has cooperated with state officials. Another of the homes on the list is on Washington Street Northeast near North Park Avenue. Despite a sign on the door warning of a lead hazard, a “for lease” sign is in the front yard from the Dasher-Lawless land development company. Christopher Alan, operator of the Auto Parkit automated parking company and Dasher Lawless, said for-lease signs go up on all of his properties regardless of whether they are move-in ready to generate business for all of his properties. In Youngstown, Krishawn Shaw lives in one of 11 homes determined to have unsafe levels of lead at 24 E. Philadelphia Ave.
Shaw said she is aware of the problem but the state has told her it will be working to make the home safe this year. She said she and her children are screened regularly for lead and the screenings have turned up no problems. “My lead level was fine,” Shaw said. Of the 11 homes, Shaw’s is the only one that appeared to be occupied. No one answered the door at the few where a reporter knocked on the door. The rest were vacant. In Warren, a house on Idlylwild Street Northeast is not on the list but had its own problems with lead paint. In January 2017, a woman found a boy, 5, wandering unattended on North Park Avenue in the cold and rain about 5:15 p.m. She put him in the car and called police. A police report says the boy’s mother told officers she and her husband were in the basement cleaning because a blood test showed the boy had a high lead level, and health officials were planning a visit to the home any day. owner dated May 25, 2017, confirmed that a child with lead poisoning was associated with the home. The owner was given 90 days to remove lead paint from dozens of areas on the exterior and interior of the home. That removal needed to be done by a licensed lead-abatement contractor, the letter said. The residents of this home were not ordered to vacate, but a Dec. 3, 2017, ODH letter says the original residents did vacate May 27, 2017. The follow- up letter gave the homeowner an extension to March 16, 2018, to finish the job. By mid-February, the work appeared to have been finished. Neither the resident nor the homeowner replied to requests for an interview. Anna and Joseph Gilbert of Iowa Avenue Northwest say they moved out of their house next to their current home four years ago because their grandson tested high for lead in his blood and the house tested positive for lead paint. No one has lived in the house since the lead was discovered, and their grandson is fine now, she said. “We just don’t allow kids to go over there, don’t allow them on the front porch, the back porch,” she said. “Most of your older homes have lead paint,” Joseph Gilbert said. May 1, 2017 11:41 a.m.